Regrets, he has a lot. 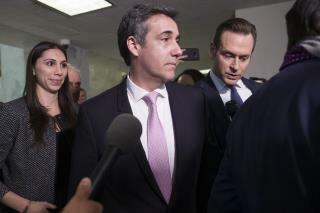 Cohen says he is deeply ashamed of his "weakness and misplaced loyalty" and of "concealing Mr. Trump’s illicit acts rather than listening to my own conscience." "I am ashamed because I know what Mr. Trump is," he says. "He is a racist. He is a conman. He is a cheat." Already-convicted-Cohen had not one thing interesting to say. This was just another diversion by the Dems. Cohen's going to prison, he's grasping at straws. snowman contest is over, nice try, BTW don't drop your soap! Poor Trump got lynched, not once by many times.